Based on my previous question of the same type, Build an adding machine using NAND logic gates, this time you're being asked to multiply instead of add. Build a diagram of (two-wire) NAND logic gates that will take the input wires A1, A2, A4, B1, B2, B4, representing two binary numbers A to B from 0 to 7, and return values on the output wires C1, C2, C4, C8, C16, and C32, representing C, which is the product of A and B. Each of these scores corresponds to the number of NAND gates that it takes to construct the corresponding gate. The top half is the multiplication network - multiply each digit with each, and group output digits with the same weight. Some bits have been left inverted to save gates. The 2x2 multiplier has then been hand-optimised to a custom-built 13-gate network, which is the optimal size as found by @boothby. Thanks! Pasting it into the low-bit corner and reoptimising the adder tree saves five gates (see revision #2). Pasting it into the high-bit corner as well, however, produces overlap. A little bit of math tells us, however, that dropping the low-bit of the high multiplier solves the overlap and what's left to do is to add the remaining two bits and sum up stuff. This alone, unfortunately, does not provide any savings, but it does open two optimisations. First, the two multipliers have two gates in common, and can be fused together. At this point, we're back at 55. Second, in the addition network, we don't need a half-adder because we know its carry will be zero. We can replace it with an OR. An OR is a NAND with its inputs inverted. This produces us with two 2-chains of NOTs on each branch, which can then be removed, for a total saving of five gates. Unfortunately, the half-adder at C16 still carries, so we cannot do the same there. 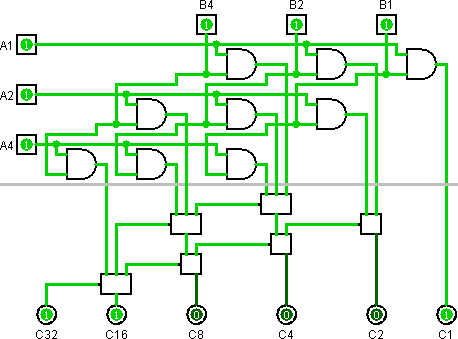 Third, a full adder has a useful property: if you invert its inputs and its outputs, it still behaves the same. Since all its inputs are already inverted, we can just as well move the inverters behind it. Twice. We could have done the same in the original, but... oh well. We still have a half-adder with two inverted inputs. I want optimise this part more, but I doubt I can. Since we're pulling out a NOT from inside a component, we have to signify that somehow. We have obtained a half-adder with inverted carry (AKA tapped XOR) at a cost of four gates. In the meantime, we have also redrawn the diagram significantly. I am quite sure there are no simpler designs than mine here. It was very difficult to make. I make other minimal circuits too. Transmission delay is indicated by downward position of each NAND gate on the sheet. 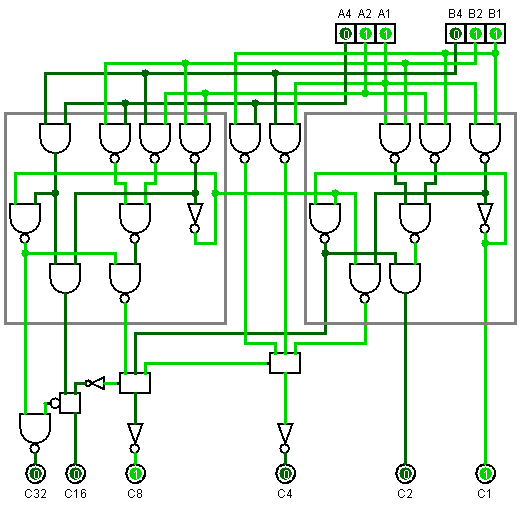 // The simplest 3 bit multiplicator possible, using 39 NAND gates only. Not the answer you're looking for? Browse other questions tagged logic-gates atomic-code-golf or ask your own question. 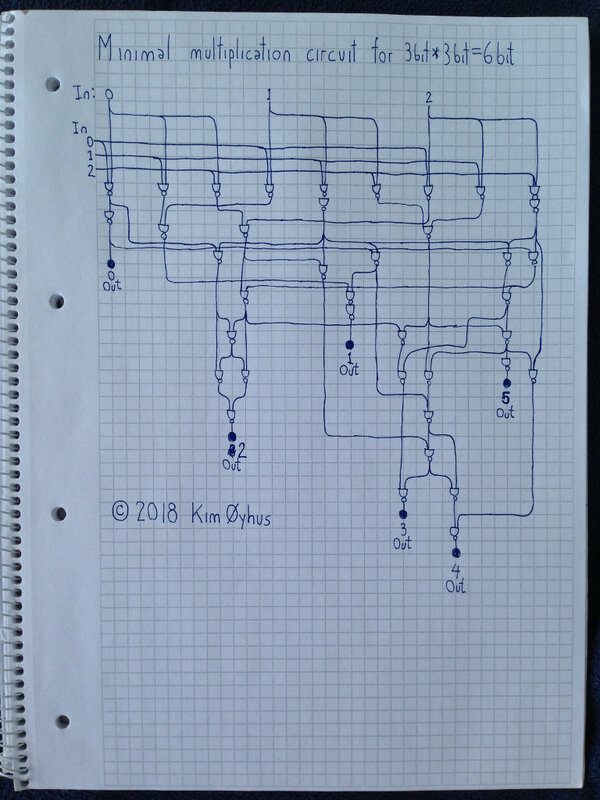 Golf all the 16 logic gates with 2 inputs and 1 output!